Now there's nothing necessarily wrong with the franchise model, but it's a little scary to see so many yogurt shops open up in such a small area in such a short amount of time (many don't even appear on Yelp or Citysearch yet because they are so new). I don't think the market is big enough to support them all -- and they are not competing only with other new yogurt shops, but also with coffee shops and ice cream shops that sell frozen yogurt. 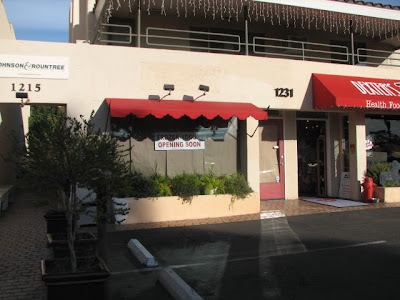 A "coming soon" frozen yogurt shop (now open) from our December CRE update. Next door is Dexter's Deli. Dexter is a dog. You can imagine Dexter's despair discovering the deployment of Three Dog Bakery just a few short blocks away. If Del Mar is over-yogurted, it's really over-gourmet-doggied. Coincidentally, Three Dog Bakery is in the same building as Java Kai Cafe, which sells frozen yogurt. 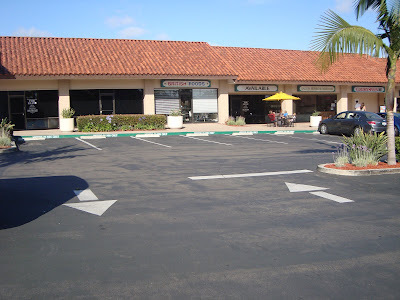 A new Golden Spoon in Solana Beach (far right) next to a salon, a vacant space, a British Food store, another vacant space, and another vacant space. It's a good thing they have those 20 minute visitor spots here -- as you can see, parking is impossible. I bet they got a deal on rent at least. Immediately on the other side of the freeway is a Baskin-Robbins. Between here and the ocean is “Twisted Tart” on Cedros, serving frozen yogurt and pastries. Across Highway 101 from there, a new frozen yogurt shop is opening next to Pizza Port. One exit down the freeway, a new Swirls is opening. And another exit down is another Golden Spoon.